1. Numeral adjectives are those which express number and order. 2. Numeral adjectives are divided into three classes. Cardinal numerals denote simply the number of objects. Ordinal numerals mark the position of an object in a series. Multiplicative numerals denote how many times as many or as much. 3. 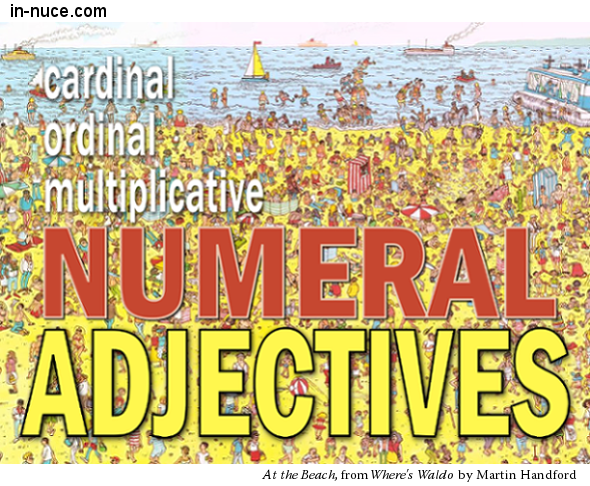 Some numeral adjectives limit singular nouns and may be parsed as single words. When such, many, only, but, and not are followed by the indefinite article a or an, the phrases such a, many a, etc., limit singular nouns. 4. Some numeral adjectives are reciprocally related. Each other and one another are sometimes called reciprocals, because they are reciprocally related. a. When such, many, only, but, and not are followed by the indefinite article a or an, the phrases such a, many a, etc., limit singular nouns. They mutually assist each other. b. Use “each” in referring to two individuals, and “one” in referring to more than two. 5. Numeral adjectives should agree with the nouns they limit.